Since the whole universe was in hot dense state at the beginning, it released a great deal of light. As the universe expanded its temperature cooled, but we still see a blackbody spectrum radiating from every direction. This is known as the cosmic microwave background (CMB). If you compare the CMB to a blackbody curve. The data matches the curve exactly. I mean really exact. The error bars on the data are too small to see on a reasonably sized graph. Of course this means we can use this curve to determine the temperature of the universe, which is about 2.725 Kelvin. The cosmic microwave background isn’t perfectly even. There are small fluctuations in the observed temperature. In the early universe some regions were slightly more dense and hot, while others were less dense cooler. These kind of random variations are expected on a certain scale. What isn’t expected are variations on a larger scale. And yet we see some larger scale variations in the CMB. In the figure below, the upper image plots the observed cosmic microwave background, while the lower image plots the “anomalies”. 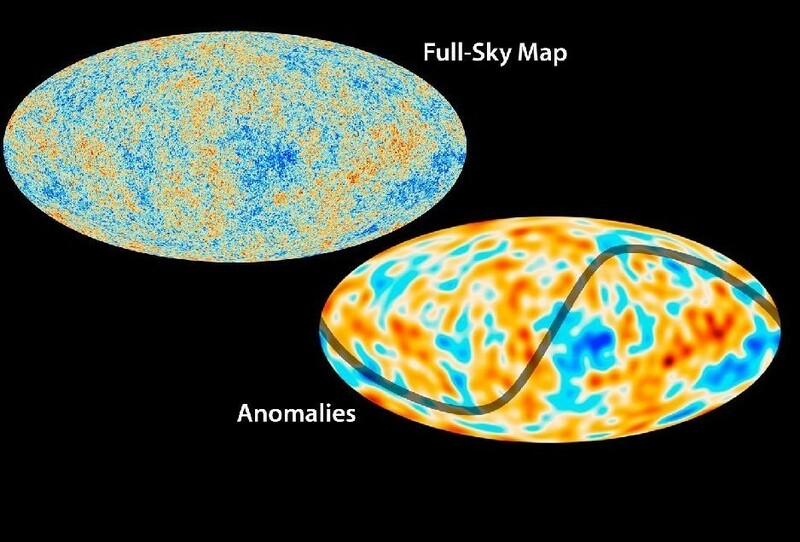 That is, the variations in the CMB that are above and beyond the variations expected by our cosmological models. You can see for example that one part of the universe appears decidedly warmer than another part. These anomalous variations exist outside the model at a statistical level known as 3-sigma. In other words, there is only about a 1% chance that they are just due to random variations allowed by our cosmological model. That might seem like long odds, but in science don’t consider an effect “real” unless it is at a 5-sigma level, or more than 1 in a million odds. The reason these anomalies raise a few eyebrows is that if they are a real effect they hint at either some exotic physics, or evidence of a multiverse (cue the popular presses!). But in a recent paper in Astronomy and Astrophysics shows these anomalies may not be as significant as we thought, due to the Sachs-Wolfe effect. Since the cosmic microwave background is a remnant of the early universe, the light we observe has travelled through the observable universe for billions of years to reach us. This means it has travelled through regions of galactic clusters, and through voids between galaxies. The gravitational variation of these clusters and voids can cause the CMB light to cool or warm slightly. The Sachs-Wolfe effect has been known for decades, but in this paper the effect was specifically applied to these anomalies. What the authors found was that while the effect lessens the significance of the anomalies, it doesn’t completely eliminate them. So it seems increasingly likely that our cosmological model works, and there isn’t any exotic physics going on. But there are still a few anomalous anomalies. I have to quibble with this. In the physical sciences 5-sigma is the accepted level of significance. But in biological and social sciences, a 3-sigma or even 2-sigma (95% likelihood that the finding is not due to chance) would be considered significant. Critters and people are more complex and various than photons, so you need to accept more random variation in their behavior.